This booklet gives Short Wu Tai Chi Kung set highlights some of the essential forms taken from the Long Wu Form. It includes: Grasping the Bird's Tail, Single Whip, Flying Oblique, Lett Hand & Step Forward White Crane spreads its Wings and Brush Knee. This sequence is divided into 3 parts and each part performed in 3 different directions. There are multiple levels of progression vrith such a sequence. 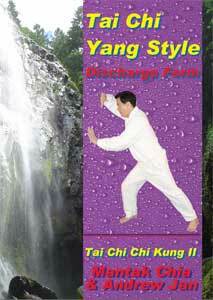 This booklet gives Short Wu Tai Chi Kung set highlights some of the essential forms taken from the Long Wu Form. It includes: Grasping the Bird's Tail, Single Whip, Flying Oblique, Left Hand and Step Forward White Crane spreads its Wings and Brush Knee. This sequence is divided into 3 parts and each part performed in 3 different directions. There are multiple levels of progression with such a sequence. The beginner learns the sequence initially through the intellectual mind and gradually embodies the principles of integrating the form with the Tan Tien Chi Kung, Iron Shirt Chi Kung I posturing, breath, martial applications and spirit. To assist this process Master Chia will provide three levels of commentary. For the first part he will highlight anatomical and geographical placement of the body for the five forms. In the second part he will discuss Iron Shirt, Chi movements and discharge of Jin. With the third part they will emphasize the martial and spirit aspects of the forms. Unlike the Yang Form, the Wu Style is characteristically performed in a small frame that is in a high stance. For many practitioners, this short sequence will satisfy their engagement with the Wu Style. Others who have more desire may progress and learn a Long Wu Form.